Resplendent in snow white or golden honey hues, South Sea pearls will capture your imagination with its elegant tropical charm. South Sea cultured pearls represent the rarest cultured pearls available on the market today. Also, as the largest of cultured pearls, South Sea pearls occupy a place of esteem among both collectors and connoisseurs. What Color are South Sea Pearls? All pearls have three factors that determine the colors you see. They are known as bodycolor, overtone, and orient. With South Sea cultured pearls, the base color, or bodycolor, will appear within a range of pure white, buttery cream, or sparkling silver. These can be influenced by hues of honey yellows, the oranges of a tropical sunset, or the refreshing blues of South Sea waters. The majority of South Sea pearls will range between white and gold. These primary colors are sometimes influenced by a secondary color known as the overtone. South Sea cultured pearls typically display overtones ranging from rosy pinks, pastel greens, and baby blues. Not every pearl will demonstrate an overtone, owing to the surprising variety Mother Nature offers. The overtone complements the bodycolor of the gem in a subtle way, resting like a watercolor wash over the primary hue. Finally, a pearl may display orient, or an iridescent effect. Not every pearl possesses orient, making those that do rarer and more coveted than those that don’t. Every pearl also has luster. Just as with other gemstones, the luster of a pearl describes how it reflects light back to the viewer. South Sea pearls typically have an excellent to fair luster. Every pearl will reflect light, with the best having bright, sharp contrast. Fair specimens will reflect less light, with images more blurred. Affecting the luster of the pearl will be its texture, or surface. South Sea cultured pearls have a clean or lightly spotted surface, allowing light to beautifully reflect as you toy with a strand between your fingers. Nacre is the coating of the pearl, and the material that gives pearls their intriguing optical properties! Primarily made from the mineral calcium carbonate, very thin layers work together over time to provide the stunning jewel that adorns a favorite necklace or ring. The nacre of South Sea pearls is acceptable, ensuring that the luster of the pearl shines to its brightest. A good nacre helps a pearl retain durability, and aids its luster. A thin nacre makes a pearl more fragile, or appear dull. If it’s too thin, the nucleus of the pearl will show, which is an undesirable trait. South Sea pearls are the largest of the cultured pearls. They can range in size from about 8 millimeters all the way up to 20mm or more! A typical specimen will measure about 13mm. Other saltwater pearls are far smaller, with Akoya pearls averaging about 8mm in size and Tahitian pearls averaging about 9mm in size. The largest freshwater pearls only grow up to approximately 14mm in size. Anywhere from ten to 30-percent of a harvest will be spherical in shape, meaning they are round or near-round. Traditionally, these are the most popular shape, and the image conjured by the mind when we picture the quintessential pearl strand. Modern fashion, however, embraces the full range of what nature creates, and the other shapes produced by these mollusks have found their home, whether the catwalk or department store. The vast majority of South Sea pearls are symmetrical in shape and account for anywhere between forty to sixty-percent of a harvest. These will be shapes such as ovals, buttons, and drops. You’ll find these pearls frequently used in pearl pendants, drop earrings, and other jewelry where the unique shape of this pearl can be appreciated. Baroque pearls are irregular in shape and size and account for the remaining twenty to forty-percent of a yield. Once cast aside as trash, baroque pearls are now appreciated for their unique forms or as a rejection of the traditional – especially the classic round pearl! Baroque South Sea cultured pearls now often find themselves in strands of their own, or one-of-a-kind pearl jewelry that celebrates the individuality of this organic gemstone. Pearl ranks between 2.5 and 4.0 on the Mohs scale of hardness, making this natural gem susceptible to scratches and abrasions. Pearls are tough and will resist the occasional bang or bump, but care should always be taken when handling these exquisite aquatic treasures. Always avoid high heat with cultured pearls. Exposure can dry them, resulting in cracks or chips. Your pearls could also become discolored. All pearls are also sensitive to chemicals. It’s recommended to avoid contact with perfumes and lotions. An age-old piece of advice reminds us to don our pearls last. This prevents you from accidentally spraying them with perfume or makeup sealer, or any other kind of chemical that can damage their delicate structure. After each wearing, wipe your cultured pearls clean with a soft, dry cloth. This will be sufficient in removing any dirt, oils or other pollutants that can damage them. You can clean your pearls more thoroughly with lukewarm water and a mild dishwashing soap. Dry them with the same kind of soft, clean cloth you use when putting them away after wear. If your pearls are strung on thread, lay them flat until they are thoroughly dry. This prevents your cord from stretching, which can weaken it over time and allow dirt to collect in the thread holes of the pearls. Are South Sea Cultured Pearls a Birthstone? 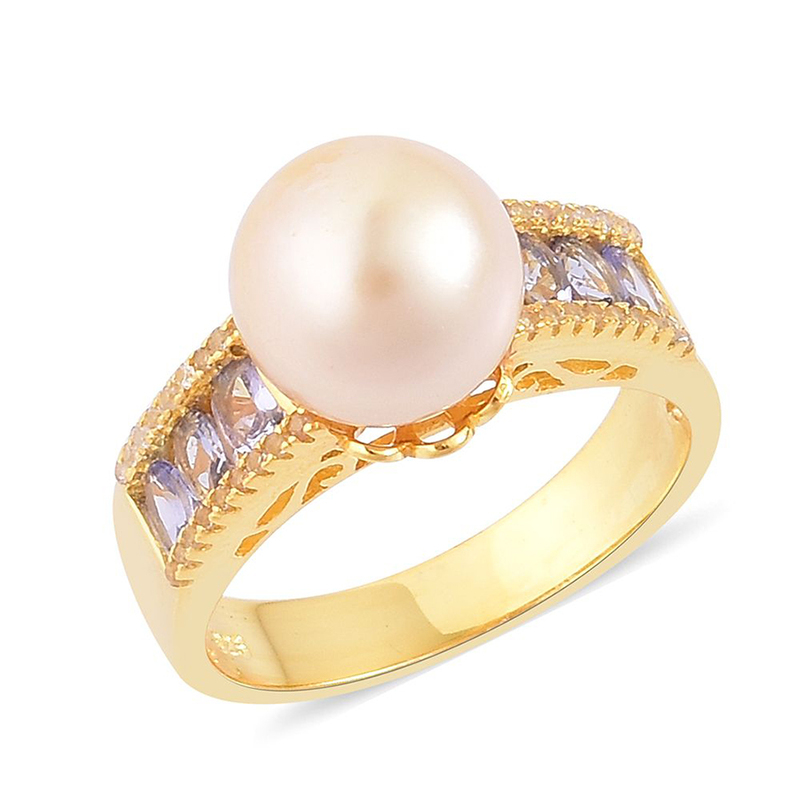 • Pearl is one of the three birthstones for June, along with moonstone and alexandrite. Any pearl may be worn as a June birthstone, including Akoya, freshwater, and Tahitian pearls. Pearls have been the modern birthstone for June since the early 20th century. 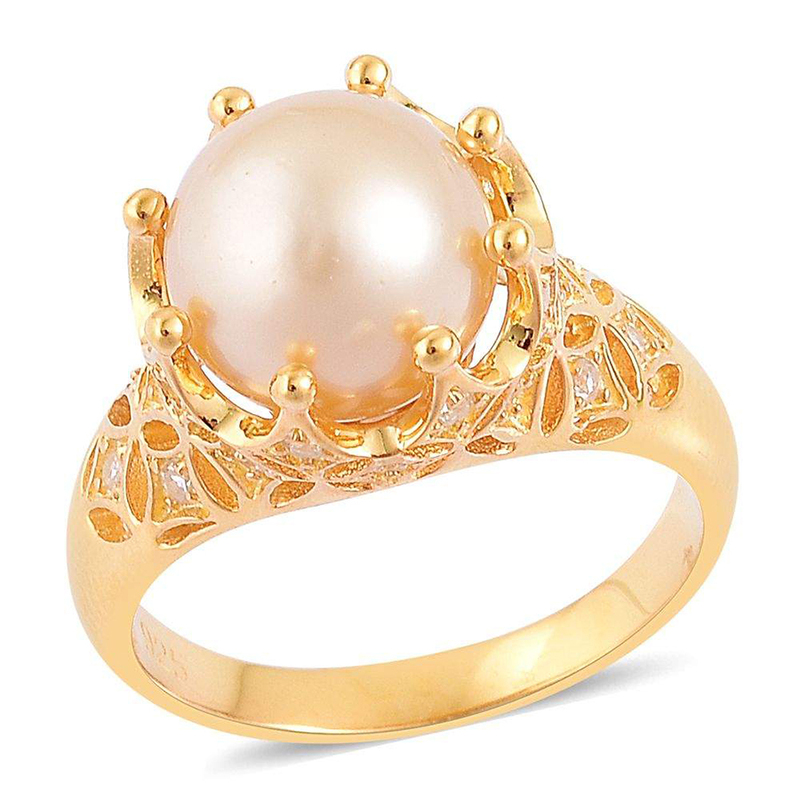 • South Sea pearls do not have an association with the tropical zodiac and don’t represent any star sign. • In Christian tradition, pearls are seen as a symbol of virtue, chastity, serenity, and purity. The Romans called pearls the tears of Venus, goddess of love, beauty, and desire. • Pearls are the traditional gift for the 30th wedding anniversary. South Sea pearls are cultured in saltwater, grown from the Pinctada maxima mollusk. It thrives in particular water conditions, so pearl harvesting tends to occur just south of the Equator between the Indian and Pacific Oceans, with Australia, Indonesia, and the Philippines leading the industry. How are South Sea Pearls Cultured? Firstly, a suitable location is necessary for raising healthy oysters. Since South Sea pearls are cultured from Pinctada maxima, warm waters are a big requirement. The mollusk is native to these waters, making farming operations easy and efficient. Conservation efforts are important, as research shows polluted waters negatively impact the quality of pearls produced. 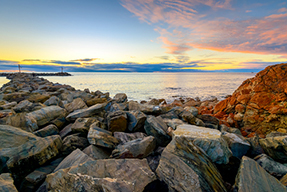 Industry-led efforts study new methods to improve the quality of the waters and minimize humanity’s impact on the oceans. White or golden pearls will develop depending on the oyster. You can tell which kind will grow by examining the lip of Pinctada maxima. White-lipped shells will produce white pearls, while gold-lipped shells produce golden pearls. Western Australia is known for their high-quality white pearls, while the Philippines are equally famous for their brilliant golden variety. A suitable stock of oysters will be identified based on their size and the quality of the nacre they produce. A portion of these oysters will be sacrificed to provide the ‘seed’ for new pearls. The oysters are harvested, and the shells are shaped into round beads. These are then inserted into the brood stock, which is then placed in cages for protection and left to grow in the sea. Two to four years are required for these magnificent pearls to grow. During this time, workers monitor the health of the mollusks, keeping their enclosures clean and ensuring that natural predators don’t damage the farming brood stock. Being submerged between 30- 40 meters deep is best for the oyster and accelerates its growth. P. maxima can grow up to 15 inches across! When oysters are ready for harvest, two actions will occur. The best of the stock is reseeded, allowing a new generation of pearls to grow and develop. As the oyster has grown during this time, the future stock is likely to be larger, representing the highest of the potential size range found in South Sea pearls. Multiple generations of pearls may be grown in this way. The remaining stock will be harvested entirely. The pearls will be collected. Shells will be used to seed a new generation of oysters or the mother of pearl used in jewelry and other decorative items. The flesh of the oyster is a popular dish and is sold at market for consumption. Collected pearls are sorted and graded by color, size, and shape. They undergo no additional treatment. If used in pearl strand necklaces, individual pearls will be carefully drilled for stringing. 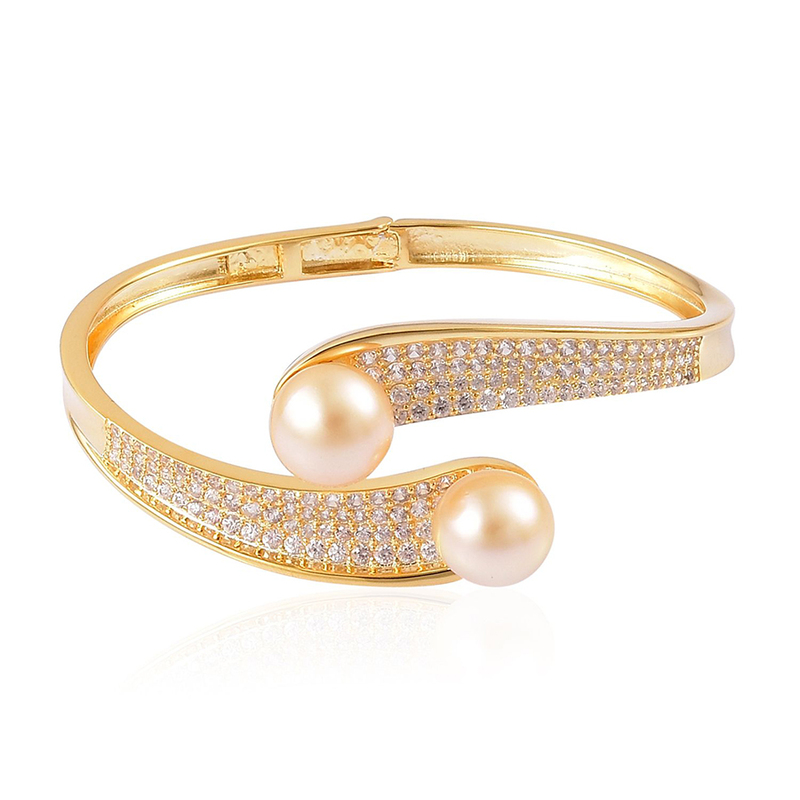 A stringent quality program ensures that the finest pearls make it to jewelry use. X-rays measure the growth of the nacre around the nucleus seed, ensuring that enough has developed to provide a suitable pearl. This also allows sorters to make sure only farm-raised oysters are used, as the x-rays will show how the oyster was seeded. Ranks 2.5 to 4.0 on the Mohs scale of hardness. 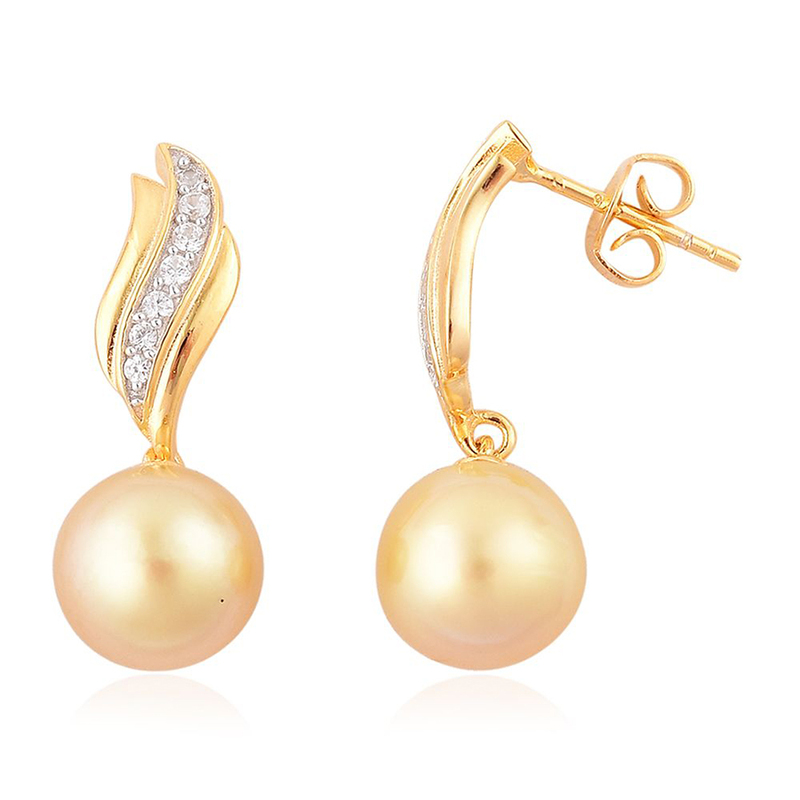 South Sea cultured pearls typically range in color from pure white to golden yellow. Sourced from Australia, Indonesia, and the Philippines. South Sea cultured pearls undergo no additional treatment.